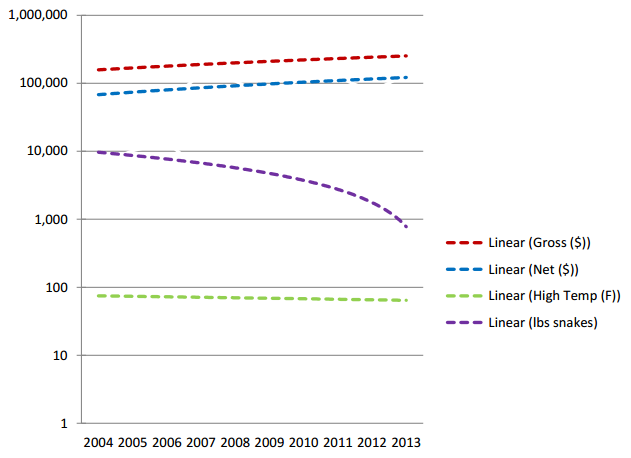 event due to the massive surplus. At the 58th annual Sweetwater Rattlesnake Roundup this March, a record 24,481 pounds of rattlesnakes (about 21,000 individuals), primarily Western Diamond-backed Rattlesnakes (Crotalus atrox), were slaughtered. That's over four times the all-time average and about five times the recent average, breaking from a trajectory of slow decline at the few remaining rattlesnake roundups. The Sweetwater Jaycees attribute this year’s record catch to heavy rains, an explanation which might hold some water, but another probable contributing factor is the possibility of an impending Texas Parks & Wildlife ban on using gasoline fumes to collect rattlesnakes, which was discussed this week at a meeting in Austin on May 25th, 2016. The Texas Parks and Wildlife Commission decided to begin developing language for a new rule either prohibiting or further regulating this practice in the state. The rule is still far from going into effect, and would include a two-year delay on the effective date. It won't be reviewed again until November 2016 (at which time, watch this space for a link to an opportunity for a public comment, if available). TPWD's Snake Harvest Working Group recommended earlier this year that Texas join 29 other states in banning this environmentally-harmful practice, which has been shown to kill numerous non-target species and has been compared with other unsportsmanlike methods of hunting, such as shooting at an out-of-range bird or fishing with dynamite. The state wildlife agency has been moving slowly but steadily to regulate rattlesnake collection in Texas because of the economic importance of rattlesnake roundups to towns like Sweetwater (e.g., over 25,000 people contributed over $8 million to the local economy in 2015, although the TPWD report found that the weather and the diversity of other events had stronger associations with profits than the number of rattlesnakes at an event). Ironically, this year's surplus of snakes drove the price of rattlesnake down so much (historically as high as $10.00 per pound, this year the price fell below $0.50/lb. despite efforts to maintain higher prices) that only about a quarter of the rattlesnakes collected were purchased for their meat, rattles, and skins before all demand had been exhausted. Rattlesnakes collected using gassing are no longer purchased by the antivenom industry, because of their short lifespan and poor health (as well as a more nuanced understanding of the importance of geographic variation in venom composition, emphasizing the necessity of knowing the geographic origin of each snake used in venom research). The fate of the rattlesnakes left unsold after Sweetwater (which some have speculated as being up to 75,000) has not been made public, although reports suggest that prices are also down at other roundups in Texas and Oklahoma, possibly as a result of vendors trying to sell their snakes there. Anyone who has gone to great expense to collect snakes in this manner and now cannot find a buyer is at risk of losing their investment. Claims about the impacts on snakebites to humans and livestock if these snakes were to be released are unsubstantiatable and untrue, considering that the survival of wild snakes captured and released elsewhere is greatly reduced (not to mention the dubiousness of the link between rattlesnake abundance and snakebite frequency in the first place). weather conditions (green) at the Sweetwater Roundup over the last decade. I am hopeful that eventually all stakeholders can overcome the cognitive dissonance between the flawed concept of predator population control (which was the original impetus behind rattlesnake roundups) and the implicit economic reasons behind their persistence. Although rattlesnake roundups are inarguably sensational and exploitative, claims about the sustainability of the wild rattlesnake harvest cannot currently be independently evaluated (I encourage anyone interested in the subject to read my previous article and check out this well-researched book). But, increasing oversight by Texas wildlife agencies could allow them or others to monitor the effect of the harvest on rattlesnakes, which could lead to valuable insights into snake biology and help prevent economic and environmental disasters like this year's Sweetwater roundup. This week's decision inches us towards the hopeful possibility of a sustainable snake harvest that could, over time, change the relationship between humans and western diamondbacks into a positive one, similar to our view of white-tailed deer, bobwhite quail, or largemouth bass. It's a non-traditional model for snake conservation, to be sure, but the efforts of the TPWD Snake Harvest Working Group combined with actions being taken by some unlikely allies, such as roundup organizer Jackie Bibby, will hopefully continue to move us towards a common goal of respectfully managing rattlesnakes as either game or non-game wildlife and not as pests. [Edit: An analysis from 2000 showed that imposing size restrictions on rattlesnake harvests to individuals >90 cm in SVL (the size at maturity for most females) would earn hunters 19% more money.] The best part: we can help people in the process (e.g., by providing healthier products with stable prices, such as rattlesnake meat untainted with gasoline). fully concealed (black), partly visible (gray), and mostly visible (white). And—as if the irony weren't already thick enough—compare the above totals with the ~2000 lbs. of Burmese Python (106 snakes) collected in Florida this year as part of an Florida Fish and Wildlife Conservation Commission-sponsored contest to control a snake whose populations actually do need to be "controlled" (despite the near-total impossibility of doing so). Among the several reasons for the difference include the lack of cultural inertia promoting snake hunting in Florida, the challenging habitat of the Everglades, and the snakes' biology—pythons don't aggregate the way rattlesnakes do. If gassing is banned in Texas, flushing rattlesnakes out of their hibernacula en masse will no longer be a legal hunting strategy. 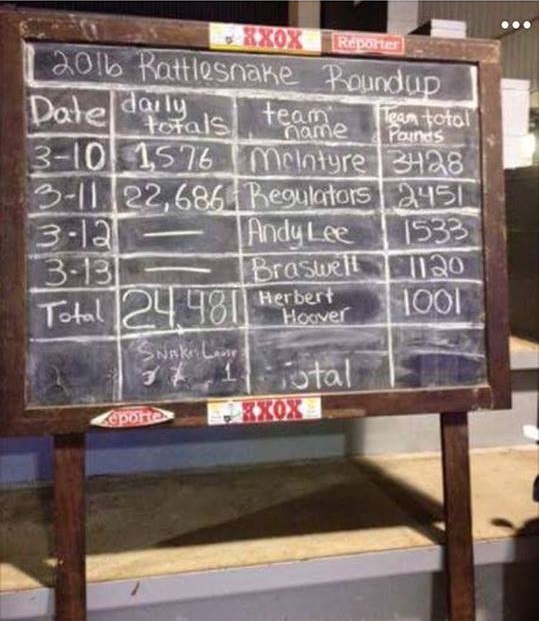 Does this mean that rattlesnake roundup totals will become more like those of the Python Challenge? Not necessarily—the TPWD report references alternative strategies already in use in other parts of the country that can still yield hundreds of pounds of rattlesnakes. 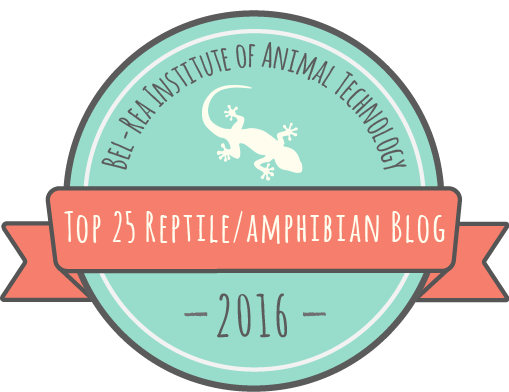 Would a change in the hunting methods allowed have positive effects on snakes and other wildlife? Almost certainly. What would be the impacts on the roundup? 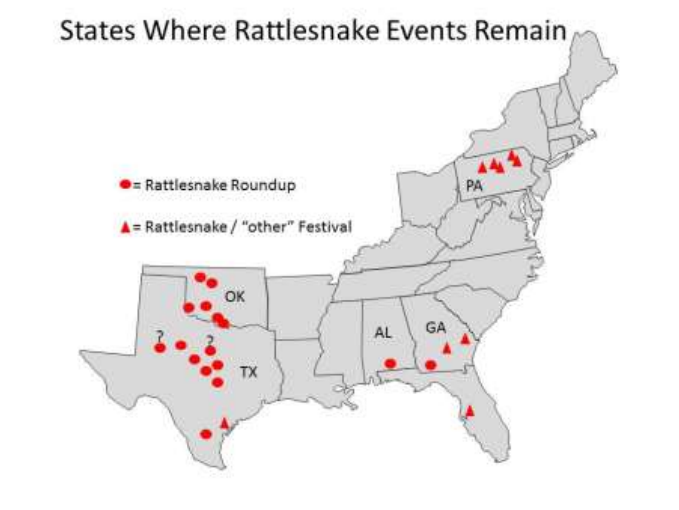 I think it's worth pointing out that many former roundups, such as the Claxton Rattlesnake Festival in Claxton, Georgia, hosted by the Evans County Wildlife Club, and the Fitzgerald Wild Chicken Festival in Fitzgerald, Georgia, still generate economic opportunity for their towns without collecting and killing wild snakes. I think it's quite likely that events like the Sweetwater Rattlesnake Roundup could continue to bring benefits to their communities without using gas to extract rattlesnakes from their dens. 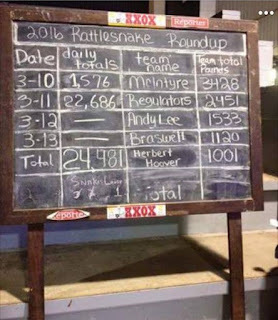 Thanks to Ray Autry and Dale Burton from the Rise Against Rattlesnake Roundups Facebook group for pointing me to some resources about the 2016 Sweetwater Roundup. Campbell, J. A., D. R. Formanowicz Jr, and E. D. Brodie Jr. 1989. 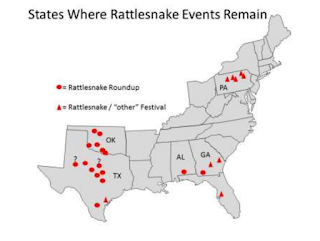 Potential impact of rattlesnake roundups on natural populations. Texas Journal of Science 41:301-317. Elliott, W. R. 2000. 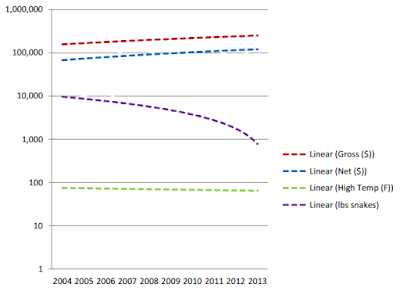 Conservation of the North American cave and karst biota. Pages 665-689 in H. Wilkens, D. Culver, and W. Humphreys, editors. Subterranean Ecosystems. Elsevier, Amsterdam. Jackley, A. M. 1939. Rattlesnake Control and Conservation. South Dakota Conservation Digest 6:11.